Games for the Weekend is a weekly feature aimed at helping you avoid doing something constructive with your downtime. Each Friday we’ll be recommending a game for Mac(s aapl), iPhone or iPad that we think is awesome enough to keep you busy until Monday, at least. I have a simple movie rating system: if it’s an action movie, looks good and has lots of explosions, it gets at least two stars. I’m not looking for movie of the year; just a simple good time. 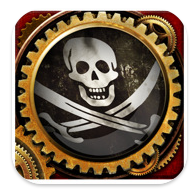 By that rating system, Crimson: Steam Pirates would garner at least two stars. Your first mate is a pretty lady, and you spend your time blowing stuff up. What’s not to love? This is by no means a historically accurate game, unless Blackbeard and his ilk had steam-powered pirate ships the history books failed to record. Crimson is a mix of real-time and turn-based gameplay. You plot out where you want your ships to go and the AI resolves the turn. Thankfully, it handles the fine details of combat and targeting automatically. Plotting your moves is fairly easy: You can tell how far your ship will move and there’s a shadow image of your boat that will tell you where it will end up. I wish there was an easier way to tell your ship to hold its position without futzing with the shadow. I also find myself forgetting I have more than one ship, and the other continues to sail off on its own. There’s an ages-old adage I remember from the wise men who stood on the street corner in my old neighborhood: The first hit is free. Bungie Aerospace use the same theory. The initial cost of the eight missions that make up the first chapter is zero dollars and zero cents. Chapter Two, which has an additional eight missions, is an in-app purchase for $1.99. There are also two pass-and-play multiplayer duels. Sadly, it doesn’t appear to support multiplayer through Game Center. The only issue I’ve found is the game won’t preserve your game if you quit the app. It’s not a huge issue, but an inconvenience if your boss walks in while you’re playing you get to your train stop and haven’t finished the mission. Crimson is a lot of fun, though, and I love that the developers let you try it for free. Right now, you can play a total of 16 missions, free and paid, and another eight are in the pipeline. This game isn’t a mix of real-time and turn-based gameplay, it’s 100% turn-based . .